Newcastle went into the Seventies as the reigning Inter-Cities Fairs Cup holders, but a quarter-final defeat on away goals to eventual losing finalists Anderlecht ended their defence of the competition. However, manager Joe Harvey continued to strengthen his side and he brought in crowd favourites such as Jimmy Smith, Terry Hibbitt and Tony Green. Glaswegian Green was a wonderfully talented midfielder, who many supporters rank among the best in the club’s history - despite injury bringing a premature end to his career after just one full season with the Magpies. However, the most famous player of the era on Tyneside was undoubtedly centre-forward Malcolm Macdonald, who signed from Luton Town for a fee of £180,000 in the summer of 1971. A debut hat-trick for 'Supermac' against Liverpool would be an ominous sign for opposition defences across the country as he went on to finish as the club’s top scorer for the next five consecutive seasons. Mixing a brashness and arrogance with immense strength and a fearsome shot, Macdonald was an icon of the decade. A regular England international, he set a record for the Three Lions in April 1975 by scoring all five goals in his country’s 5-0 win over Cyprus. Either side of that, he fired Newcastle to two cup finals in 1974 and 1976 - with his two-goals against Burnley in a semi-final at Hillsborough in '74 regarded as one of his greatest games at club level. However, against Liverpool in the FA Cup and Manchester City in the League Cup, United were beaten at Wembley on both occasions. Macdonald left for Arsenal after the second of those defeats and United soon slipped into the Second Division. 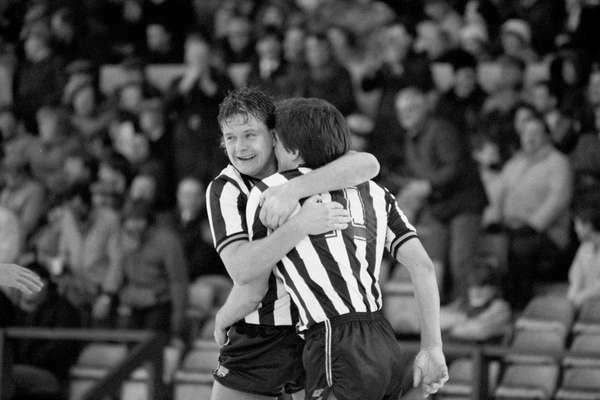 Gordon Lee replaced Harvey as boss before Richard Dinnis and then Bill McGarry took the St. James' Park hot seat. Former Chesterfield boss Arthur Cox moved to Tyneside in 1980 and despite eventually achieving promotion, his greatest legacy would be the 1982 capture of former Liverpool and England star Kevin Keegan from Southampton. It proved to be a sensational signing; Keegan becoming the talisman the club had been searching for since Macdonald’s exit six years prior. 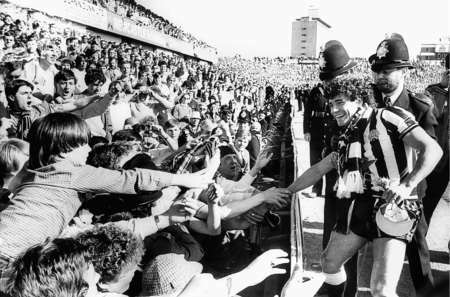 Just 9,419 fans had watched the final home game of the previous campaign, but 36,718 packed into St. James’ Park to watch Keegan’s debut and he didn’t disappoint, scoring the only goal in a victory over Queens Park Rangers. Promotion wasn’t achieved that season, but in 1983/84 United stormed back into the top flight. Alongside Keegan were the likes of Terry McDermott, John Anderson and David McCreery, as well as local youngsters Peter Beardsley and Chris Waddle. With promotion secured, 'King Kev' said his goodbyes before famously departing St. James’ Park by helicopter following a match against former club Liverpool held in his honour. Keegan may have gone, but the emergence of a Gateshead-born youngster by the name of Paul Gascoigne offered real hope for the future as the club consolidated its place in the First Division. The talents of ‘Gazza’, Beardsley and Waddle were also being noticed beyond the banks of the River Tyne and before long, a host of top clubs began to jostle for their services. Waddle left for Tottenham Hotspur in 1985 - just months after Gascoigne's senior Newcastle debut, Beardsley was snapped up by Liverpool in 1987 and a year later in 1988, Gascoigne followed Waddle to White Hart Lane. Although big money was spent on adding Dave Beasant, Andy Thorn, John Hendrie and John Robertson to the squad, United were relegated again in 1989. A battle for control of the club would break out at boardroom level and by December 1991, the Magpies looked to be nosediving helplessly towards the third tier of English football for the first time in their history. However, the second coming of 'King Kev' was not far away.